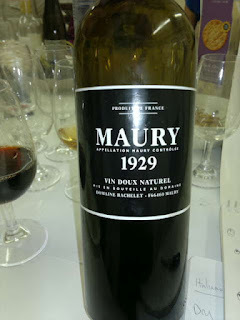 We had convened with but one wine in mind, an 83 year old Grenache Vin Doux Naturel. But one bottle doth not a tasting make; and so there were ten sweet wines lined up for us to try. Such a lovely selection of wines, and so very sweet that for the half hour or so after the tasting it seemed to me that the world was sparkling and glittery. We started with two supermarket muscats from Southern France. A Rivesaltes with an annoyingly punctuated name, Mu: is for Muscat (Waitrose) and a St Jean de Minervois (Sainsbury) . The former was dried tropical fruit and rose scented talc, the latter was fresh elderflower, but there was a spicy note in both. The Sainsbury bottle had a terrible whiff of cabbage about it when opened, but that was gone after an hour. Then came two Chenins, one aged 27 and the other just 2 years old. The elder, Moulin Touchais Coteaux de Layon 1985, had lost interest in its original fruit character in favour of distinguished age, while the younger, Château de la Roulerie Coteaux de Layon Chaume 2010 complemented the typical green apple notes with a peachy touch and intense sweetness. In a double handful of sweet wines, this one seemed the sweetest by a country mile. The main attraction and purpose of our meeting, Domaine Bachelet Maury 1929, still had some red glints in the depths. The nose was of middling intensity, with the dried fruit and wood richness of old armagnac, edging into rancio. Very mellow, although still having enough smooth tannin to give it structure, the palate was in harmonious agreement with the nose. Lots of rich dried fruits, prunes, and red berries.There was a bitter note in the finish, but overall a very good to excellent wine, and a rare treat to have such an ancient. Wine six was a surprise. Pure cherry juice, backed by cedar and meaty notes; Corte Sant'Alda Recioto della Valpollicella 2008 seemed very different from a previous tasting. Vintage variation or just age difference? I don't know. The next two were also Italian, and served to demonstrate the lightly regulated and heterogeneous nature of the sweet wines of the Appenine peninsula. 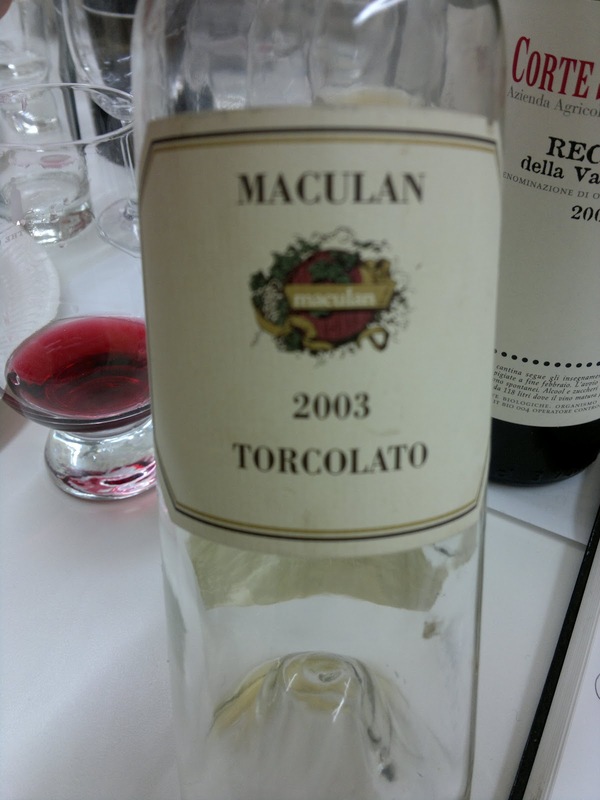 Maculan Torcolato 2003 managed the clever trick of being simultaneously buttery, petrolly, and minty. I should note here that it goes fantastically well with honey-sweetened goats cheese. Castillo de Querceto Vin Santo di Chianti Classico 2008 was so aromatic that we seriously considered the possibility that it might be aromatised. Coriander, fennel,walnut skins, plus a sherried note made for a delicious and very unusual wine. The Mission Hill Reserve Riesling Icewine 2003 seemed very fresh. The nose was pure strawberry jam, but oddly the palate was very clear-cut pineapple juice - an unlikely combination of flavours, no? Not very Riesling-y, but very very lovely. 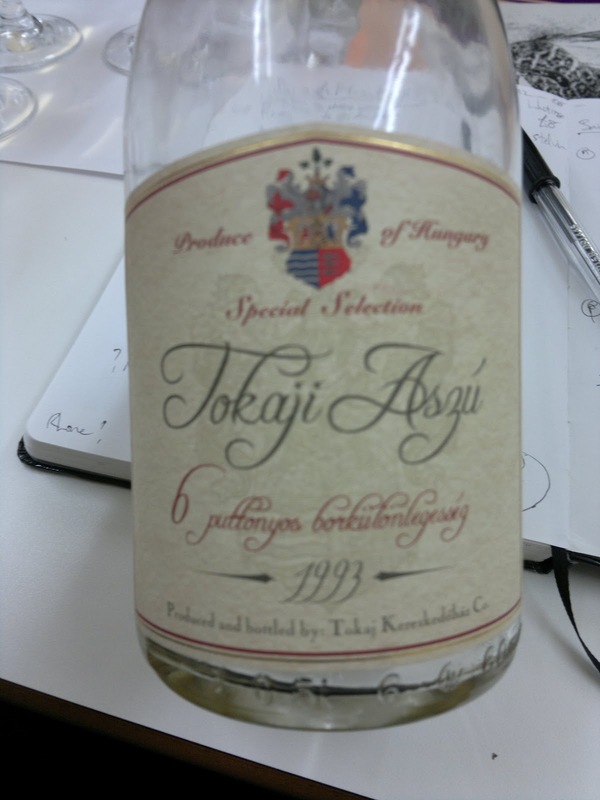 Last up was Kereskedőház Tokaji Aszú 6 Puttonyos 1993. It was dryer than expected (and much less sweet than the Roulerie). In an oxidative style and with notes of raisins, butter, brazil nuts and torrefaction, it was, if not unctuous, certainly very richly textured. And after all that, as I say, the world sparkled.